How many times over the past week have you said to yourself I’m not, I can’t, I don’t know, I could never…? Maybe the words were spoken silently in a lament for a dress size you can never seem to achieve, or for the absent support of a boss or co-worker, or for an internal struggle that seems overwhelming. What would happen if we took all the energy it takes to process these thoughts and redirected it? Changing our response is a powerful – and difficult – move. I’ve learned through transition that changing our response to triggers or to the emotions of transition is incredibly important if we are to grow as adults. I would go so far as to say that we can do anything if we can only change our response to triggers or to the emotions that can run rampant during a transition cycle. My guess is that I don’t need to convince you about the negative impact of phrases like, ‘I’m not…..’ Claire Messud, a best-selling fiction writer, explored the impact of these phrases in her recent book, The Woman Upstairs. Through her fictional lens, “I could never…,” is seen as a perverse invitation to mask our instincts in order to align with some expectation or another. Overtime, her characters powerfully observe that the mask becomes skin; ill-fitting, unfamiliar, and complete. What if we changed our response to these simple – pernicious – phrases? What if instead we practiced fierce acceptance of all that we are? Let me back track a bit and tell you why I am onto this theme. In early April I realized how much I was working against myself. I am embarrassed to admit this but my own ‘worst enemy’ traits have been on overdrive of late. The long and the short of it is that I recognized that I had been operating under a pall with respect to my work. It went something like this. In spite of establishing myself as a thought leader on transition – including writing a book, speaking, consulting, advocating, and teaching – my internal talk track constantly reminded me of what the work was not. It was not a proven business model ready to hire employees. It was not the result of a best-selling nonfiction work nor was it a widely acclaimed podcast. My nots went in all sorts of directions. Frankly, they had little to do with what I really wanted out of my work. My knowledge of transition helped me re-frame what was happening. I knew the issue was less about what my work was not. The issue was my inability to decouple from the measurement lens of the world I had previously occupied. Long time readers may recall that one of the shifts underway in transition is a shift in how we set our definitions and expectations for ourselves. As we enter adulthood, those expectations and definitions of ourselves are derived from our social environment, including forces like our families, the community we live in, our occupation, or the schools we attend. As we grow, our expectations and definitions of ourselves are derived from our own self-authored set of beliefs. Transition, at its baseline, is growth in how define the expectations and definition of who we are. Yes, I had successfully grown into a self-authoring world but at times I harbored a few tentacles that reached back into the social. My measurement tentacle was stepping forward just as I was writing my second book. Fighting is a better description. I was fighting with every line on the page. I finally said to myself, ‘What if I just celebrated the opportunity for this creative project? What if I simply enjoyed it?’ Instead of filtering every sentence and paragraph through the pall, I opened myself up for whatever might come. Not just on the page. Everywhere. My speaking and advocacy and teaching. The challenge was to accept who I had become everywhere. Dare I say celebrate it? The result has been surprising. One friend summed it up in a simple statement. “Wow, that was so different.” She was describing a speech I gave last week and comparing it to one I gave one year ago. Yes, something is different. Maybe I’ve (finally!!) broken the last vestiges of social. Maybe I am growing into my transition even further. Not sure. One thing is certain, I am embracing who I am in every context. Hopefully – most especially – on the page. I think that I have been practicing fierce acceptance. I can only describe it in one way. Love. Please know that I am not referring to a doe-eyed sentimental love nor a conceited self-aggrandized love. I am instead moved by something that Bishop Michael Curry, the presiding head of the Episcopal Church, said during his sermon at the Royal Wedding. “Love is the way.” His love hinged on an acceptance – if not an all-out embrace – of differences and on our willingness to believe above all else. For those willing to love, Curry reflected, everything is possible. What would be possible if you unconditionally – fiercely – embraced all of who you are? My hope for you today is that love smiles back at you each morning in the mirror and that you recognize that you alone possess incredible gifts. It is these gifts that open you up to the opportunity for unchecked possibility. Remember, with love, everything is possible. What will love enable in you? Thank you for reading. Take a moment to comment below or tell me what’s on your mind: linda@womenandtransition.com. 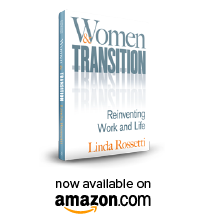 This entry was posted in Observations on Transition and tagged careeer transition, divorce, empty nests, job loss, loving ourselves, retirement, transition, Women and Transition: Reinventing Work and Life. Bookmark the permalink. Thank you for this post. It speaks volumes to this moment in my life.